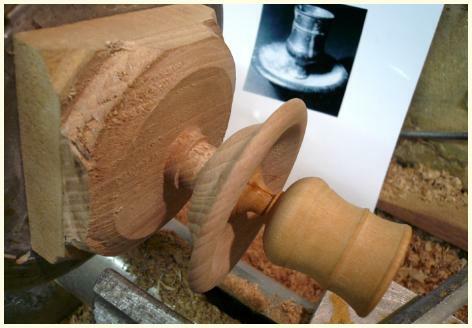 The candle sconce you see mounted on the lathe has been turned to match the reference photograph in the background. This was a trial run to establish a good match to the original. Once we were happy that it was the same, we turned a new one in pear wood and carved the decoration using the photograph as reference. From this a mould was made and it was then cast in brass, patinated, and fitted to its painted wooden arms.